TPTKD is mourning the passing of Merwin (Mike) Wittum April 8, 2019 from a massive stroke. Mike was one of the original 19 TPTKD black belts and a master instructor. He started Taekwondo in 1974 and supported our organization for decades. He will be greatly missed by all who knew him. Senior Master Bruce Park Sr., an original student of Grand Master Tae Zee Park, succumbed to cancer on Easter Sunday April 5, 2015. He was noted to be one of the first students to be taught by Grand Master Park and rose within the ranks to establish himself as an authority on breaking and power breaking. He traveled within the US to help promote taekwondo and teach to the new students of Tae Park Tae Kwon Do. His son, Master Bruce Park Jr. follows in his fathers very large footsteps to grow his own organization in Knoxville, Tennessee. Senior Master Park will be greatly missed at all the annual events as well as at the Central Studio in Jackson, Michigan where his presence was felt for over 35 years. Our deep condolences to his wife and family as they prepare to continue life without him. Junior Grand Master Dennis Lewis with SM Park. A US war veteran with SM Park. Thank you Ms. Kelly Nye for this beautiful, heartfelt message. I too have started and stopped composing many letters to express my feelings about recent days. It is very hard to talk about. However, I want to share a few things with you. This past weekend, I have never been more proud to be a student of Madden Institue. Master Madden was my teacher and my friend. He taught me so much more than TKD. He demonstrated true martial art… determination, dignity, respect, grace… and I will keep memories of that in a special place of my heart forever. Next, I was so taken by the, “once a member of this family, always a member of this family”, feeling conveyed by West Michigan TKD. I have not been active in class for the past 2 years or so. However, the warm friendly embrace from Master Good and all of the TKD family, felt like being wrapped in a comfortable old blanket. I thank you all. Finally, I was so impressed by the entire Tae Park Organization. Like Master Madden, this is a ‘class act’. We are united in a way that is undescribable and yet needs no describing. I am so very proud of all Tae Park TKD members and their demonstration of love and loyality in this great man’s honor. I guess I feel like I should continue to wear Madden Institute, however, I will wear, with pride, any patch or belt that the group determines most appropriate. I love the idea of a chair at tests for Mr. Madden, because I know he wouldn’t miss one! I know that his students will always be taken care of and his Institute will live on in our hearts and minds for years to come. Finally, thank you my TKD family. Thank you for getting thru the past weekend with me. Thank you for the privilege of being a part of such a unique ‘class act’. Master Madden is smiling! Today was my / our last chance to stand at attention and bow to a good Master in the Art of Tae Kwon Do. This was not an easy task nor one welcomed but one that was well earned and deserved. Master Madden showed what a Black Belt is. What a Master is in how he lived his life. He fought and never gave up. He was a good husband and father. He was a man you could count on. He was what some try to be. As you may know Master Michael C Madden fought cancer for 3 years plus. Did you know he was originally given one year to live? Michael never gave up. He kicked rectal cancer to the curb. But he also had liver cancer. This one he got it to submit for a short time. Things were getting better. When this all started Michael weighed in at 185lbs. He went down to 135 at one point. His weight improved as did his health. He started to practice again. We had hope. We had said many prayers and the Lord listened. But back in February the Lord started to call Michael. But Michael still did not give up. He kept fighting. He tried a couple of different treatments but the cancer had gotten stronger and Michael was getting weaker. But still he did not give up. On May 20th Michael was taken to the hospital by his wife Karen. Before they left home he insisted he have his computer bag. Why? Because there was a test in two days and he had for years been the coordinator for tests in West Michigan. Two weeks prior when asked, Michael told me this would be his last test to do. Then he would allow someone to take over. On May 26th Master Michael Madden was honored in front of his home by more than 100 white belts all the way through 9th Dan Black Belts. He was presented with a 5th Dan Black Belt certificate and Belt. Also presented was his trophy for Black belt of the Year from the West Michigan Tae Kwon Do Association (actually given on 5/21/10). Michael was able sit straight and hold his head high and smile. The TV channel FOX 17 and the GR Press were both there to record this event for history. On May 27th Master Madden was able to see his oldest daughter, Kelli, marry her fiancée, Robert. Again he was able to sit straight and hold his head high. This moment was one he wanted to have when he learned months ago he did not have much time left here on this Earth. On Friday morning, May 28th, I stopped and visited Michael and Karen and family on my way to work that day. Many times Michael was my roommate here in the USA and in China. Michael never snored. Friday he was snoring. I mentioned this and my feeling he was now resting well. When I got out of work I turned on my cell phone and there was one voice mail. “You have one voice mail, phone number 616-540-………”. This was one number I knew and one call I did not want to get, ever. The call was made at 6:34pm on Friday may 28th. I returned the call. Michael had passed about 6:45pm. There was no way I could have gotten to their home but I would have tried had I known earlier. I raced from work while making several phone calls. My wife and son joined me at Master Madden’s home. No dry eyes there but relief in knowing that Michael C Madden was now finally at peace. No more pain and discomfort. He was in Heaven with the Ultimate Grand Master. Over the weekend, supposed to be a holiday weekend, there were three chances for visitation with Michael’s family and friends. We had an Honor Guard of Black Belts at his side. Many people in and out of TKD came to say “Goodbye”. There were many poster boards organized with pictures from his family life and his TKD life. Also on display were his Branch Flag, his 5th Dan Certificate and Belt, his trophy for “2010 BB of the Year”. His Master’s Jacket. A plaque presented to Master Madden from Senior Master James Rodgers for all he had done for the Art of Tae Kwon Do and Tae Park Tae Kwon Do. Today, June 1st, was the funeral ceremony in which he was again honored. I thank his pallbearers Mr H Tran, Mr C Nye, Mr M Tran, Mrs K Nye, Mr P La Vigne, Mrs D Houseman, all Master Madden’s students, who were led by Master R Wrona. Thank you to all the TKD students who took time and made a corridor of honor for the passing of Master Madden. Thank you Mr L Brewer for the TV contacts that allowed many not present in person to see and honor Master Madden in their own ways. I presented Mrs Madden with Master Madden’s 5th Dan certificate and Grand Master Park presented her with his trophy for “BB of the Year 2010”. I sincerely thank Grand Master Park for joining me in honoring Master Madden today, as well as Junior Grand Masters Warren and Barss, Senior Masters Anderson, Rodgers, and Ensing, Masters Arthur, Bowhuis, Heglund, M Klingebeil, Lofquist, Lucas, Oring, Vora, Wrona. Hope I did not miss any Masters and if I have I apologize. Thank you to all the students that joined us at the cemetery. I will miss my student, fellow Master and best friend. One added thing I offer about Master Madden. In all of his 21 years in TKD he only caused me one small “headache”. He helped relieve many of them for me. Master Madden was always there to help in whatever manner he could. I wish I could have more like Michael. It is with great sadness that we announce that Master Michael Madden, 5th Dan, has passed away on the evening of this Friday, May 28. Master Madden was 49 years old and fought bravely against liver cancer. Clyde Park SW, Wyoming MI. Master Madden’s funeral will be on Tuesday, June 1.. There will be a service at 11:00 AM at St. John Vianney Church on 4101 Clyde Park SW, Wyoming MI. The service will be followed by a luncheon and then at the cemetery at 2:00 PM. Be advised that TKD uniforms are not allowed at the church. However, we ask for the presence of as many students as possible (from white belts to 3rd Dan blackbelts) in full uniform to make two lines from the hearse to the chapel (interment location). Over 100 Tae Park Institute students and masters gathered outside Master Madden’s house May 26, 2010 to present him with his 5th dan and thank him for his many years of service. It was a tremendous outpouring for such a dedicated taekwondoist. 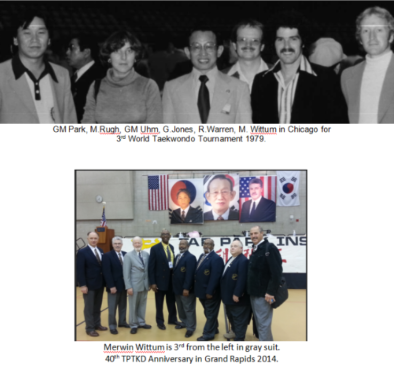 Grand Rapids Press article on Mike Madden 5th Dan Ceremony. Jody Novakoski and Tuyet Tran for the pictures. Pictures can also be viewed in our Gallery. We encourage anyone who might have taken pictures of the event to submit them to us. More pictures and videos coming soon. Dress appropriately. 3rd Dan and below in uniform (or professional apparel). 4th Dan and above in Masters Jacket (or professional apparel). PLEASE, park in public parking areas close to his home and do NOT block his driveway. the passing of his student, Daniel Ziglinski. As we teach and grow year after year we become close. We are instructors and students, and we always need to remember our place and uphold the mannerisms of Tae Kwon Do. But low and behold we end up loving one another or at a minimum respecting each other, despite our differences. We all Love Tae Park and all he has done for us. We all love Tae Kwon Do and that’s why we do what we do. #1 How wonderful you all are to me, and how much I appreciate all of you. Even if I do not know you personally. #2 I have a student named Daniel Ziglinski. He is a low blue belt. You might remember him trying to break the 8 boards in Tennessee with a slippery side kick. He didn’t break them that day, which I thought was strange because this guy had an exceptional slippery side kick. This story of Daniel started near the end November. We were about to test and Daniel came down with a bad cough and began to feel really bad. He never liked to miss class, and after missing two or three he decided to return so he could get ready for the testing. He was coughing and hacking so bad I told him he had to go to the doctor and get checked out because I could not have him hacking all over Grand Master Park and all the rest of us when we went to Tennessee. Daniel was kind of like me. We think we can ride sickness out and our bodies will heal themselves. We got the MAN’S – MAN thing going on and we don’t need to go to a doctor. “Dah”. But that’s how we are. So Daniel went and got an anti biotic. His cough was minimized for the Tennessee seminar, but when we got back to Kansas City he went back to the doctor. The doctor gave him another anti biotic because the first one helped but it didn’t cure him. A few weeks latter around the first of April, Daniel went back to the doctor and told him he was still feeling ill. so they took pictures of his lungs and low and behold, Daniel had stage 4 cancer. That is as bad as it gets I am told. Daniel is a strong Christian and knows he is going to be with God in heaven, and is very comfortable with that. He told me his only problem was that he wasn’t sure God was teaching Tae Kwon Do up there. I assured him that God is greatest Master of all so not to worry. In the middle of April they gave Daniel 6 months to a year to live. Daniel died yesterday, May 15, 2010. He was in his 40’s, a single man with a huge family and a wonderful girl friend named Rebeca, who is a low green belt with us. Daniel will be truly missed. He was a wonderful young man, a pleasure to be around, and a really good blue belt that would have made a great black belt, should he have been allowed to stay with us. I will miss him. I am also sure Daniel would like me to thank all of you for being in his life, to thank you for Tae Park Tae Kwon do. to tell you if you don’t have God in your life you should. Why is one can hold on to God’s promises that after we die we will be going to a better place, and Gods peace during these last few months have comforted him more than most can imagine. In closing I want to thank you all, and to tell you how great it is to know you. May God Bless you and keep you close to him.